Dear Readers, Here we have given from Reasoning Questions for Upcoming Bank PO/Clerk Exam 2016. Candidates those who are all preparing for these exams can use this material. 1). If ‘A × D’ means ‘A is sister of D’, ‘A + D’ means ‘D is the daughter of A’ and ‘A / D’ means ‘A is the mother of D’, then how will ‘N is the aunt of M’ be denoted? Directions (Q. Nos. 2-3) Read the following information carefully to answer the questions that follow. I. ‘A + B’ means ‘A is the son of B’. II. ‘A – B’ means ‘A is the wife of B’. III. ‘A × B’ means ’A is the brother of B’. IV. ‘A / B’ means ‘A is the mother of B’. V. ‘A = B’ means ‘A is the sister of B’. 2). What does ‘P × R / Q’ means ? 3). What does ‘P = R / Q’ means ? Directions (Q. Nos 4-5) Read the following information carefully and answer the questions that follow. I. P + Q means P is the father of Q.
II. P – Q means P is the wife of Q.
III. P × Q means P is the brother of Q.
IV. P / Q means P is the daughter of Q. 4). If A / C + D + B, then which of the following statement is true ? 5). If A – C + B, then which of the following statements is true ? Directions (Q. Nos 6-8) Read the following information carefully and answer the questions given below. I . ‘P × Q’ means ‘P is the father of Q’. III. ‘P + Q’ means ‘P is the mother of Q’. IV. ‘P / Q’ means ‘P is the brother of Q’. 6). In the expression B + D × M / N, how is M related to B ? 7). Which of the following represent ‘J is the son of F’ ? 8). 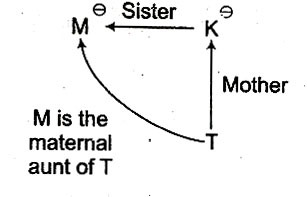 Which of the following represents ‘R is the niece of M’ ? Directions (Q. Nos 9-10) Read the following information carefully to answer the questions that follow. I. ‘P + Q’ means ‘P is the father of Q’. III. ‘P × Q’ means ‘P is the brother of Q’. IV. ‘P / Q’ means ‘P is the sister of Q’. 9). Which of the following means ‘H’ is paternal grandfather of T ? 10). Which of the following means ‘M is maternal uncle of T’ ? Now , by applying above decoding method, we can check all the options for the required relationship. So, N is the daughter of M.
Now, it is clear that N is the aunt of M.
Clearly, P is the uncle of Q. Clearly, P is the aunt of Q. So, it clear that A is the aunt of B. Now, it is clear that A is the mother of B. Hence, it is clear that M is the grandson of B. 7). By applying above decoding method, we can check all the options for the required relationship. So, none of the options is correct to answer the question. Here, gender of R is not known. So, R is either niece or nephew of M.
As, we have already obtained the answer, so there is no need to check other options. Hence, there is no need to check other options, as we have already obtained the answer. Hence, there is no need to check other options.